Happy Monday everyone! Hope you all had a fantastic weekend. Before I get to the SURPRISE party I threw this past weekend, let me just get through some business first. I have decided to extend the Williams Sonoma bunny giveaway to Friday at 12 p.m. If you are the winner, I will send these out Friday and you will have them in plenty of time for Easter! So please enter...they are so cute!! Now for the surprise. You know my good friend Amanda from the fabulous design blog CasaBrasi. Check out her beautiful blog and if you need some pillows or home design help, she should be your gal. 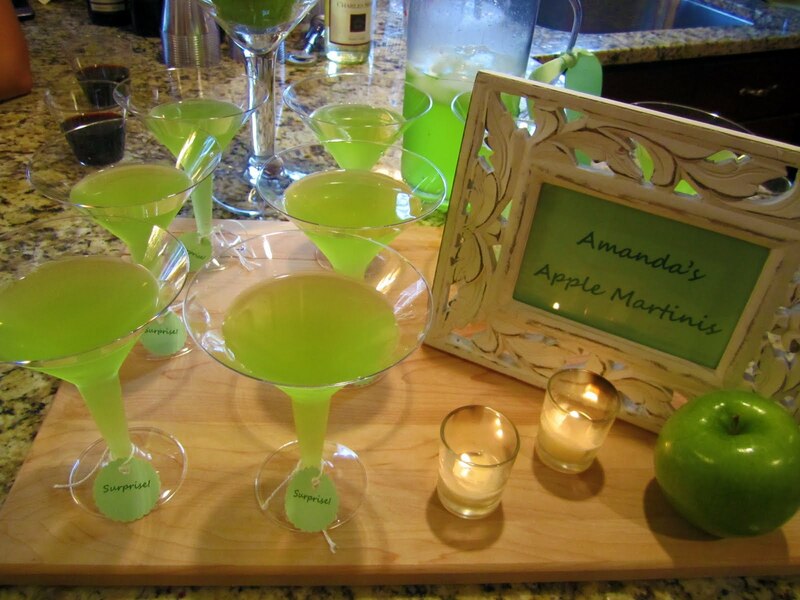 Amanda likes simplicity and loves the color green, so I wanted to do an underlying theme of green and just a few simple but special touches. 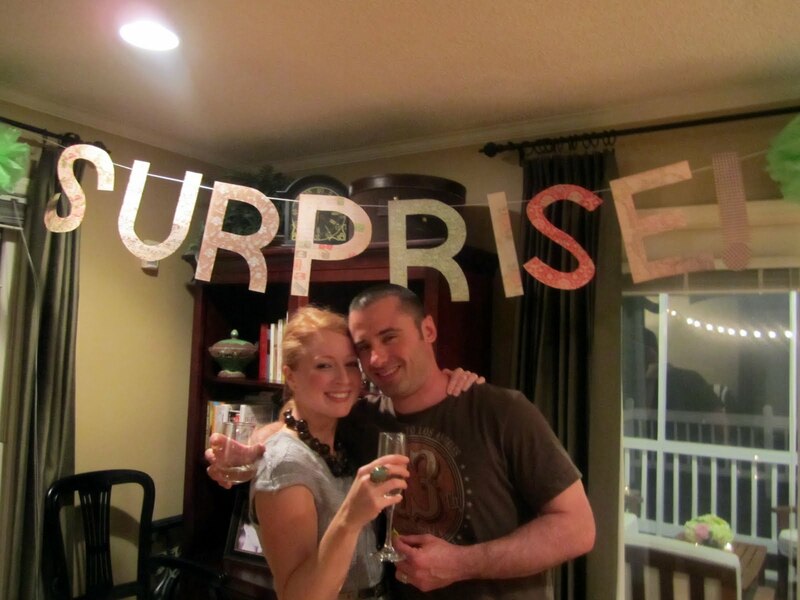 I knew I wanted a big sign that said "SURPRISE!," but I couldn't find one I liked. When all else fails, make it yourself! 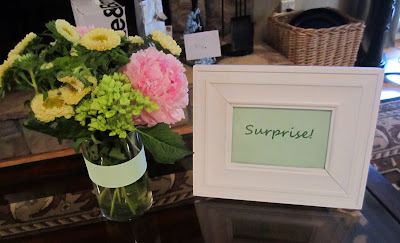 I enlisted the help of my husband, who can cut a straight line like nobody's business, and we created a lovely Surprise banner made from scrapbook paper. All of the party guests stood under the surprise sign and yelled...you guessed it... "SURPRISE!" Amanda had a fabulous reaction and was genuinely surprised. I loved it. 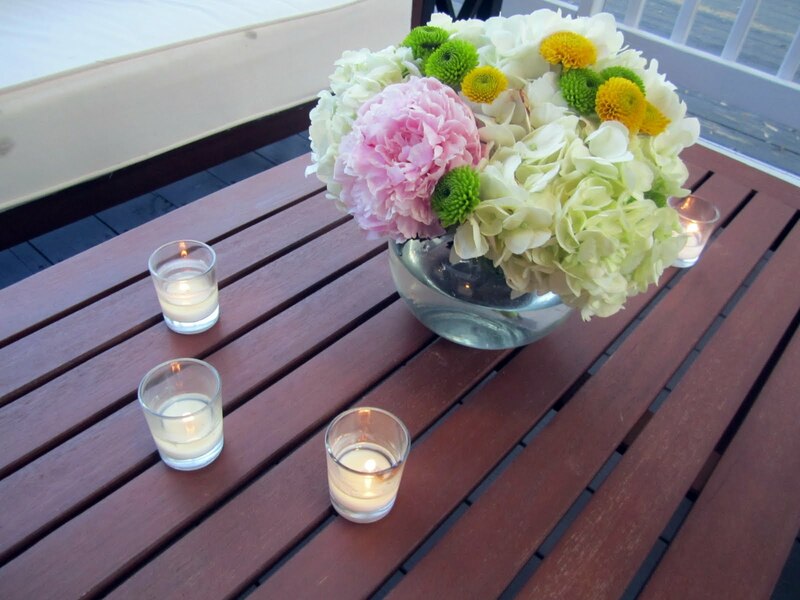 I had a blast arranging flowers. 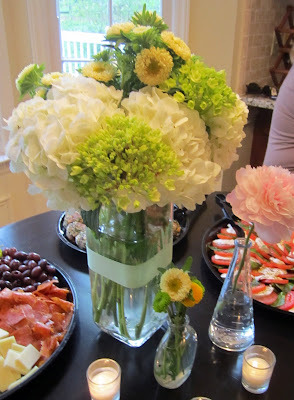 I used Amanda's favorite, hydrangeas and mixed in some green, yellow and gorgeous pink peonies. I loved how they came out! 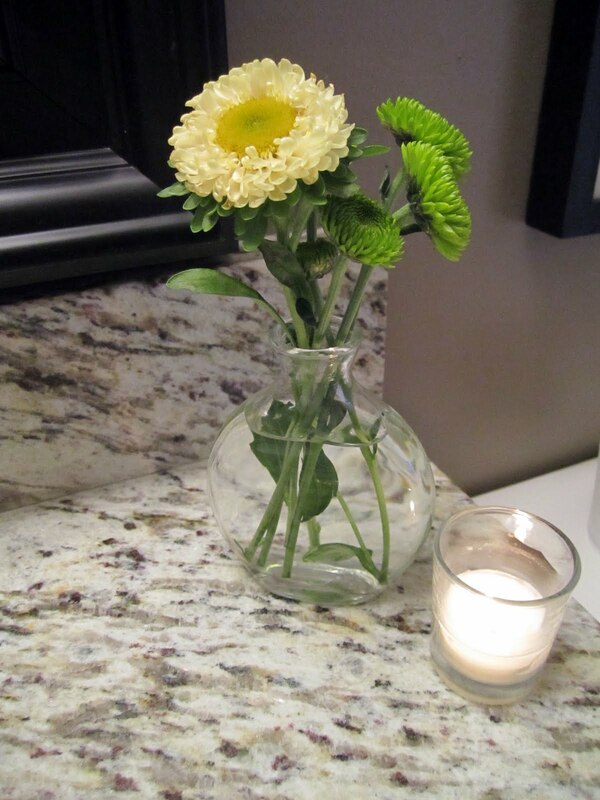 Jackie Fo signature bathroom flower, of course. Amanda LOVES apple martinis...seriously, give this girl an apple martini and she will par-tay! 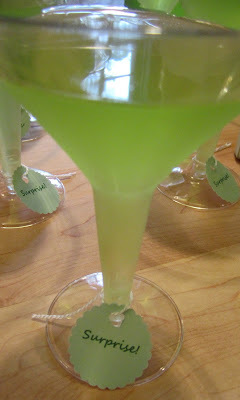 I made some "surprise" drink tags for the martini glasses. My favorite part of the party? It had to be the cupcakes. I made Amanda's favorite, red velvet, using Martha Stewart's recipe. 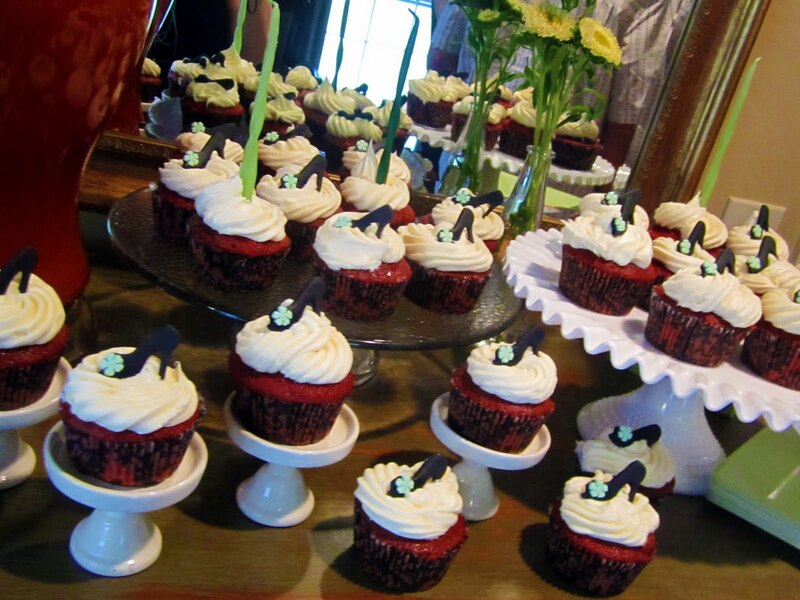 Not only were the cupcakes delicious (if I do say so myself) they were accessorized! Not only is Amanda a great designer, the girl can DRESS...as someone that worked with her for many years, she did not have a bad hair day or ever rock a bad outfit! So look what I found on Etsy to symbolize her fashionista style? 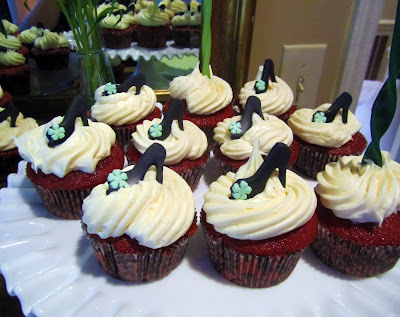 Yes, those are little fondant high heels!!! I found these on Sweetfavors08 Etsy shop. They were super affordable and everyone loved them! 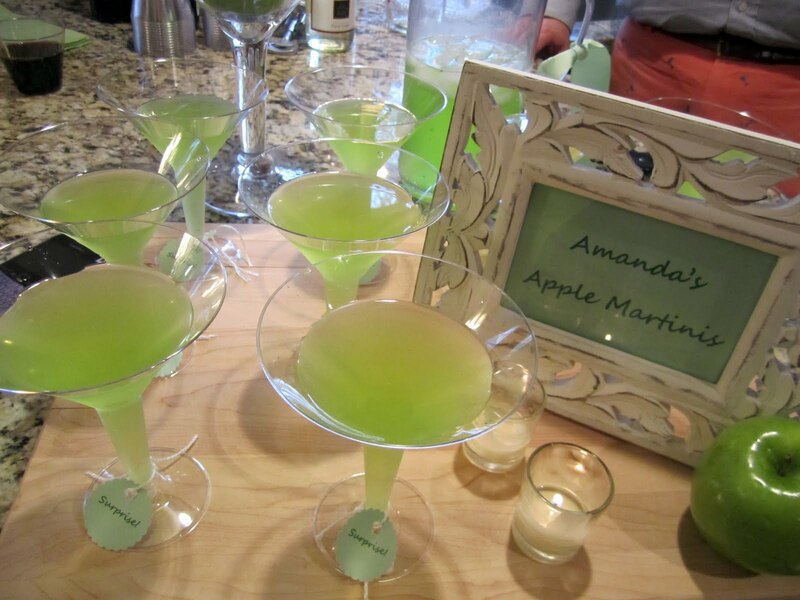 This was so fun to do and the party couldn't have been for a sweeter girl! I have great posts coming up this week, including Part 2 of my fabulous Springtime and Easter round up! such a sweet party! 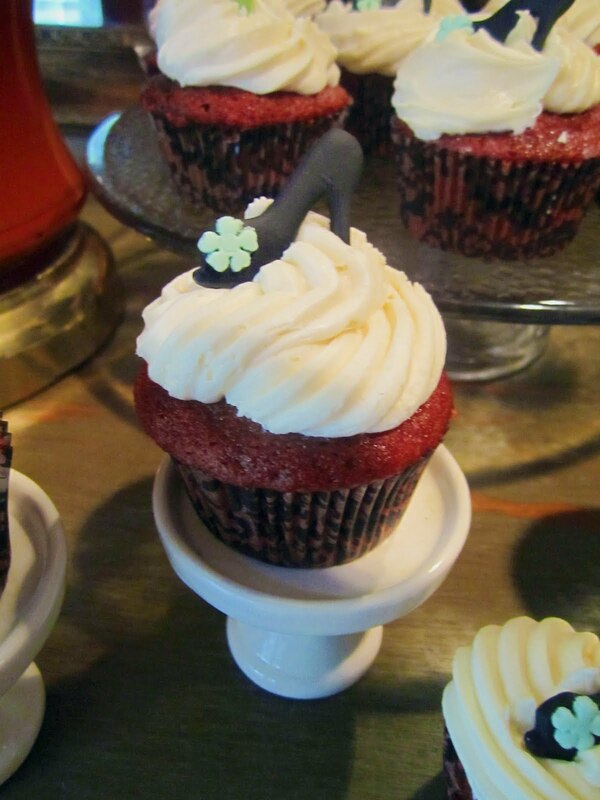 love the fondant toppers and individual cupcake stands! It was so great! Those flowers are still looking good too! Btw, that suprise banner still hangs in my living room. Can't take it down yet. 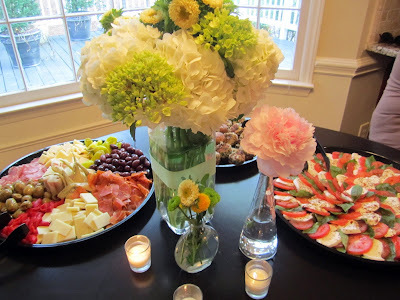 Thanks so much for a great party Jackie! Yay for Amanda! What an awesome party. Looooooove those signature cocktails! Looks like this was a lot of fun! 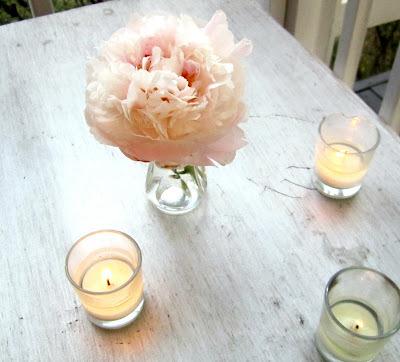 I love hydrangeas and peonies....those arrangements are beautiful!